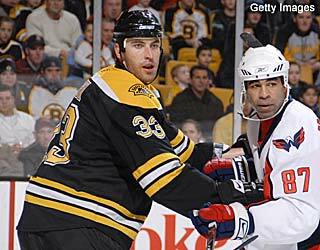 The Boston Bruins were riding a six-game winning streak before they visited the Washington Capitals on Monday. Five days, three losses and 19 goals allowed later, the Bruins will be searching for answers defensively on Saturday when they host the Capitals, who scored a season-high 10 goals against Boston earlier this week. The Capitals may not have just quickly and explosively ended the Bruins' winning streak in that game. Instead, thanks to six first-period goals and three goalie changes, Washington appeared to derail Boston's confidence and send goaltender Tim Thomas into a tailspin with a 10-2 win on Monday. The Bruins (35-25-7) have lost two games at home since then, unable to provide any offense in a 1-0 overtime loss to Florida on Tuesday before getting blown out again in an 8-2 defeat to Toronto on Thursday. Boston is still in seventh place in the Eastern Conference, just one point ahead of eighth-place Philadelphia. "I don't think it's time to panic," Boston coach Claude Julien said. "It's certainly time to make the adjustments and address. I don't know if it's we're totally out of sync or the pressure. We've just got to take a step back." Backup goalie Alex Auld played well against the Panthers, but Thomas had another disastrous outing against the Maple Leafs, as he was pulled for the second straight game after allowing five goals on 23 shots. Thomas had been chased from Monday's loss to Washington twice, allowing a total of seven goals on 24 shots. "We're just a little fragile right now," Thomas said. "We haven't really been that all year." It's unclear who will start on Saturday, but neither goalie played well in Monday's game against Washington. Auld allowed three goals on 10 shots in relief of Thomas, though he stopped 31 shots and shut out Florida through regulation on Tuesday and would seem the likely candidate to face the Capitals (32-28-8). Whoever it is will be facing a Washington team that has won two straight and four of five, following up the blowout win over the Bruins with a 3-1 victory at Buffalo on Wednesday. After scoring a hat trick in the first period and totaling five points against the Bruins, Alexander Ovechkin had two more goals against the Sabres, giving him six goals and three assists in the last three games. He set a new career high with 54 goals, which easily leads the NHL. "He's a fantastic player," Capitals goalie Olie Kolzig said. "I don't know what else you guys can write about him, but he's the best I've ever played with." Kolzig enters Saturday with 299 career wins, but he's been splitting time with newly acquired Cristobal Huet, who came to Washington from Montreal in a trade last week. Huet is 2-0-0 with a 1.20 goals-against average in two starts since joining the Capitals, and he is 4-0-0 with a 1.91 GAA against the Bruins this season, all with the Canadiens. For his career, he is 9-2-0 with a 2.00 GAA and three shutouts against Boston. The Capitals acquired Huet in hopes of aiding their playoff push. Washington stands four points behind the Flyers for the final playoff spot, and five points behind first-place Carolina in the Southeast Division. "The last two years, we didn't play for something. ... We started thinking about vacation," Ovechkin said. "It's more interesting when you play for something." Washington had gone 1-3-5 in its previous nine games against Boston before Monday, and the Capitals have lost three straight at the TD Banknorth Garden. That includes a 2-0 loss on Jan. 3, when Thomas stopped all 31 shots. Thomas had never lost to the Capitals in regulation before Monday, going 8-0-1 with a 1.82 GAA.